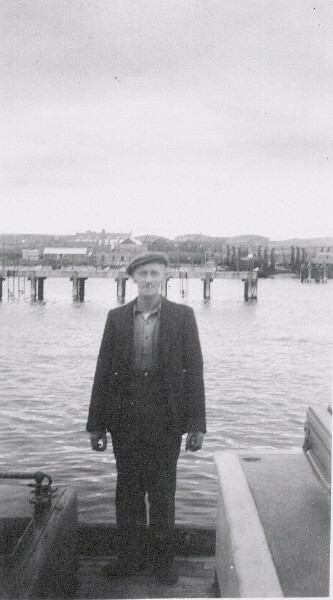 Here is Fachy Dunn aboard the Harbour Masters Launch, his place of employment for many years. The larger version shows more detail of the dockyards, target shed etc. It also gives an amazing view of the Royal Hotel. Would this be taken with the boat alongside of the pontoon on the middle pier? - or the admiralty pier....? I think this was taken at the end of the middle pier, most probably from the pontoon on the end. The concrete pier comes out half way down the main pier. Thanks Doug, I thought it was. All the years I spent on the pontoon, I didn't realise you could see the Royal Hotel from there. I was probably too busy getting into mischief.